1. She is the first child of the ’70s to take the role. 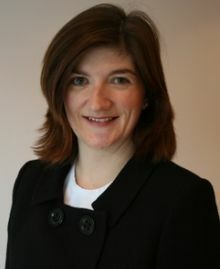 Born on 1st October 1972, Morgan is 8 years younger than the average age of entry to the Education Secretary circuit which runs at 49. 2. Morgan was born in Kingston-Upon-Thames, making her the 10th Edu Sec to be born in a London Borough. (That’s about a third of them). 3. So far, all Education Secretaries born after 1952 attended private school. Morgan is no different. She attended Surbiton High School an independent, Anglican school for girls aged 4-18. 4. At university, Morgan studied Jurisprudence. She is the fifth Conservative Edu Sec to do so, trailing Mark Carlisle, Keith Joseph, Ken Baker and Ken Clarke. 5. In another predictable twist, Morgan studied at Oxford. However, she is the first to come from St. Hugh’s College, so at least that’s novel. (You laugh, but more Edu Secs studied at Christ Church than comprehensives). 6. Her full name is Nicola Ann Morgan. She is the first female Edu Sec to be officially known by a shortened version of her first name. 7. Morgan has one child. The average for an Edu Sec is now 1.76. The most common number is still zero. 8. Though many Edu Secs studied law, few practised it. Morgan, however, worked as a Corporate Solicitor advising on mergers and acquisitions. This will likely do her some favours when dealing with the thorny legalities of academies. 9. Morgan’s predecessor, Michael Gove, was in power for 1525 days – almost double the average for an Education Secretary. To match this longevity Morgan would need to still be in post on 16th September 2018. 10. Finally, 42 words and phrases rhyme with the word ‘Morgan’. Start drafting your blog headlines now. Point 6. ‘Maggie’ Thatcher was Education Secretary. Morgan and I were born on the same day, 4 years apart. That’s 1.5 more interesting facts to add to your list. I pondered Maggie. But she was only called that by voters/tabloids. Her official government stuff was all ‘Margaret’ whereas Morgan is Nicky on hers. (e.g. Hansard).